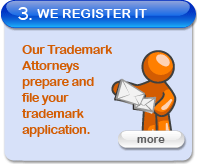 Experienced Trademark Attorneys - Not an unlicensed or unqualified document filing service. For the fixed price of $485 plus the required Trademark Office filing fee of $325.00, our experienced Trademark Attorneys research, prepare and file your trademark application. No hidden fees. No undisclosed add-on charges. No bait and switch offers, and no surprises. Just sound legal advice you can trust from experienced Trademark Attorneys. Don't be misled, the fact is Trademark Law is complex. You need accurate legal advice from a licensed Trademark Attorney to alert you to the many considerations and possible risks involved in using or registering your trademark. 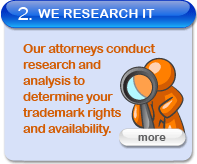 We are established Trademark Attorneys recognized for accurate legal advice and affordable pricing. We are not an on-line trademark business, unkown entity or online "document handling / filing service" selling sub standard trademark searches or unqualified legal opinions which may subject you to liability and adversely impact your legal rights and business future. Since 1989, Bischoff & Associates has focused its law practice on trademark registration and trademark related matters. Our experienced Trademark Attorneys provide in-depth, comprehensive trademark searches; prepare and file trademark applications; and register and protect your trademark. Our success is measured by your success. As licensed Trademark Attorneys, we help with trademarks which have been refused registration or conflict with identical or similar trademarks. We also help protect trademarks subject to being cancelled, opposed or challenged by third parties or competitors. There are many unique trademark issues which confront small and large businesses, individuals and entrepreneurs. To protect your trademark rights and prevent trademark infringement claims, we create registration and protection strategies custom tailored to your unique fact pattern and situation. Our experienced Trademark Attorneys work on your trademark application from start to finish. 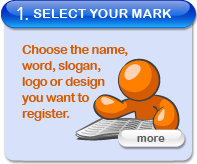 Your trademark is the symbol of your goodwill and reputation, and is one of your most valuable business assets. Protect this valuable asset by entrusting it to a Trademark Attorney at TrademarkSearch.com.